First, we will be looking into the various changes on the card designs themselves. 森 , Grassland 草原 , Urban 町 , Mysterious 不思議な , and Legendary 伝説 . It’s unclear if this was going to be some sort of mechanic in the game itself, but it does seem to be reflected in the background art of the cards. Could this have been an unimplemented feature from Red and Green’s Pokédex that happened to have carried over? The TCG did begin development before RG released, after all. 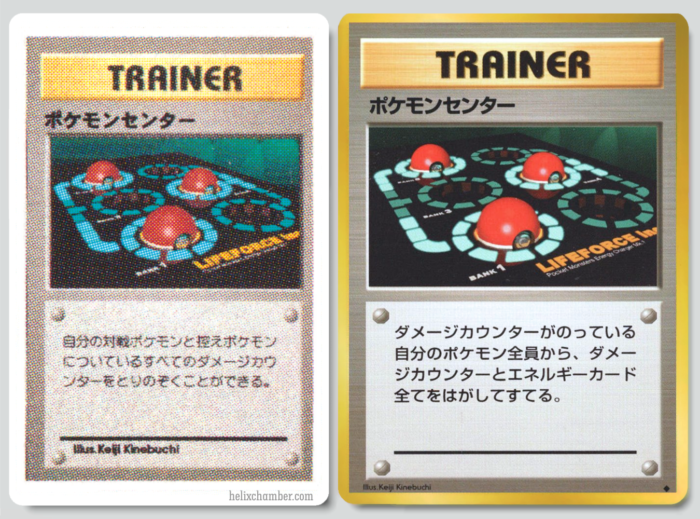 Interestingly, classifying Pokemon by habitats was also a feature in the Fire Red / Leaf Green Pokédex many years later, Urban (まち) , Forest (もり) and Grassland (そうげん) also appearing with the same name on the card prototypes (町, 森, 草原), however we can only speculate on whether or not the TCG and Red and Green influenced this feature. There are no rarity symbols on these cards. Either they didn’t plan to tell people that via the circle, square, or star symbols and were instead just going to opt for holofoil or they simply hadn’t determined which rarities they were going to give to which cards yet. If they were a late addition, that might explain how Starmie somehow ended up as a common. 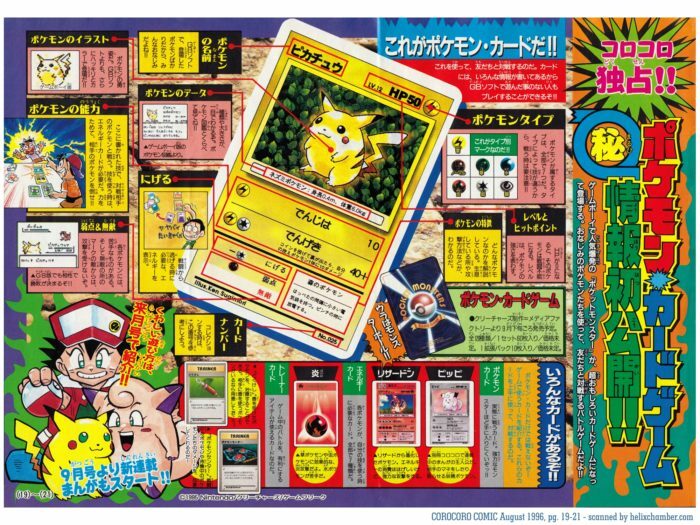 The prototype card back appeared in 1996 in the August, September and October issues of CoroCoro Comic. 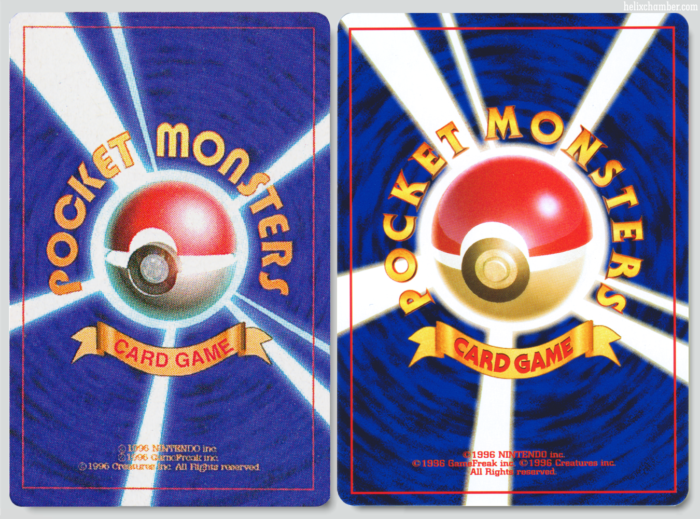 The fonts used on the backs of the cards are slightly different, with the “CARD GAME” text being fairly basic. While basically using the same model by Keiji Kinebuchi, The render of the Pokéball is rougher with the light beams at different angles and the Pokeball button has its top face visible. Copyright text is yellow on the prototype card instead of red and is spaced differently. Keiji Kinebuchi, Mitsuhiro Arita, and Tomokazu Imakuni. 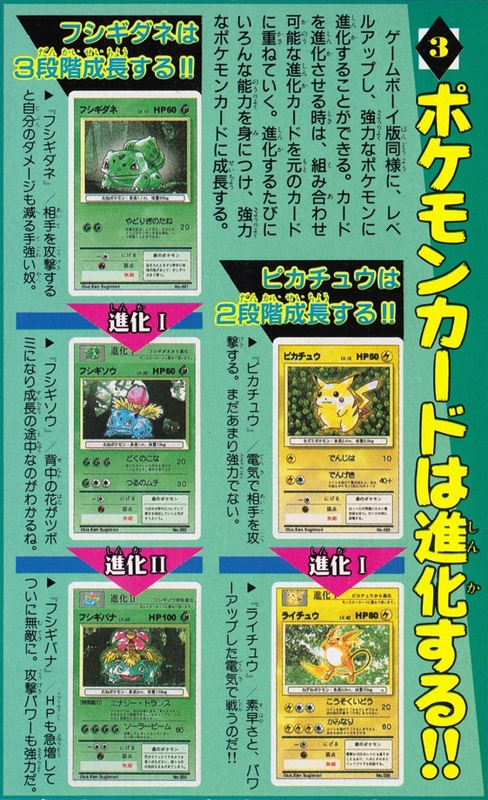 Interestingly in the September 1996 issue CoroCoro announced the 102 cards of the first set would’ve featured 20 new Pokémon illustrations, while the final set ended up featuring 31. Cards’ outside borders and info boxes are white instead of yellow, and the picture borders are a lighter color of whatever type the Pokemon is instead of yellow. 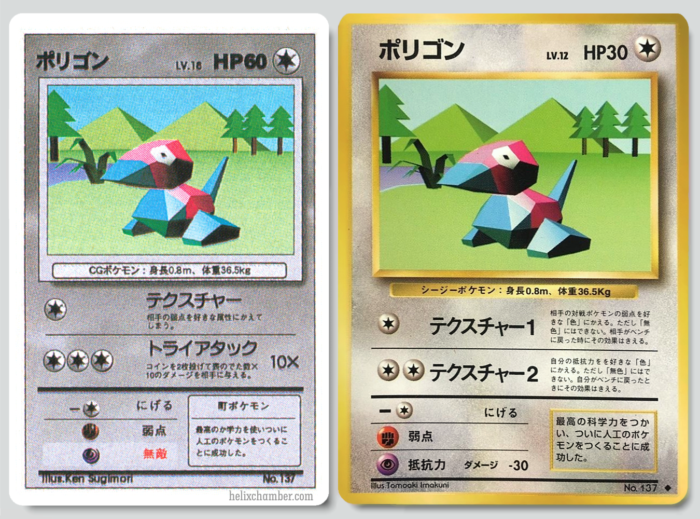 None of the known prototype cards are depicted as holographic, so it’s unknown whether they were considering that at this stage. 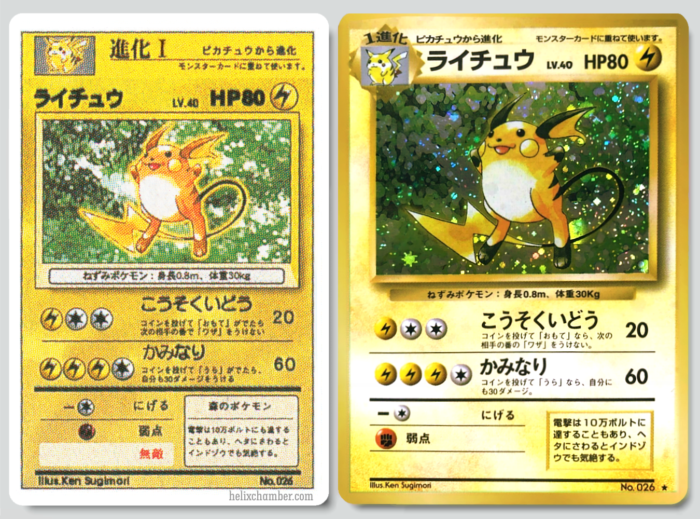 Evolutions used “進化 I” or “進化 II” instead of “1 進化” or “2 進化” in the “evolves from” text. In what can be presumed are earlier versions, several words use kanji instead of katakana in certain iterations, such as 裏 instead of 「うら」for ‘tails’. 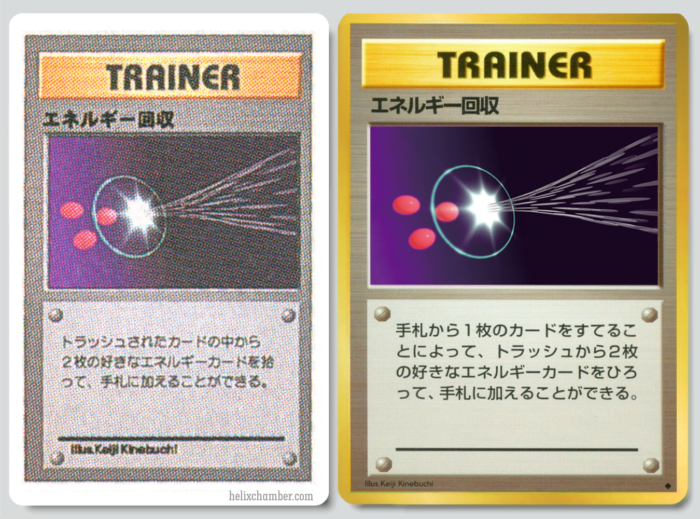 Pokémon Power 「 特殊能力 」text is black instead of red, while “Kilogram” uses “kg” instead of the final “Kg”. It’s tempting to think that the differences in height and weight might be holdovers from some earlier Pokédex entries in Red and Green, however, they could just be typos, or placeholders that were meant to be changed in a later canon-check pass. Inconsistencies in wording, as well as status effect definitions, show that there seemed to have been different stages of development of the card game’s language and features while these prototype cards were being designed. Resistance is shown with a red font and uses a different word, 無敵 (muteki, which might imply invulnerability against a type), does not specify the amount of damage resisted, uses a lighter colored box, and is present even if the Pokémon has no resistances. In the final, if there isn’t a resistance, there is no text or box at all. 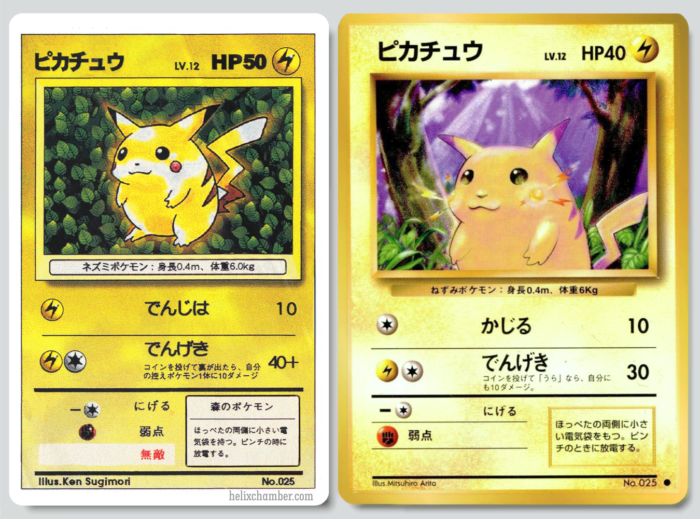 Pokédex entries are the same with some decisions changed on whether to use kanji or katakana. 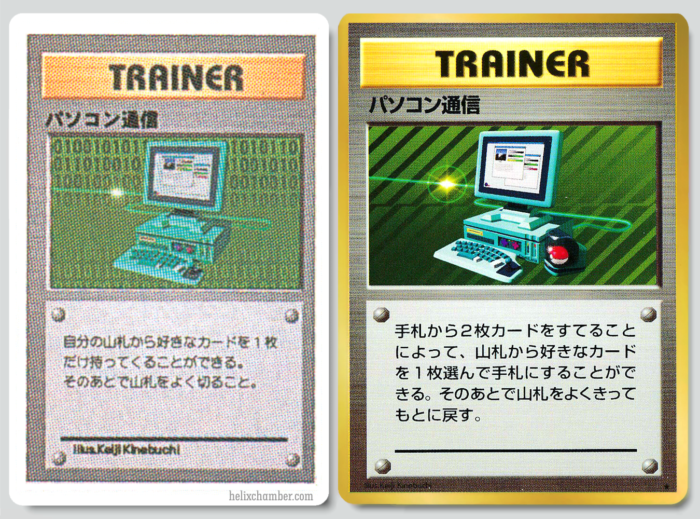 Since the original games exclusively used kana for dex entries, the card game’s entries had to have kanji added in accordance with the reading level of the target audience or possibly for space issues. Next, it’s time to delve into the Pokemon cards themselves. 1.1m/90kg in prototype (notably bigger and heavier than Ivysaur even if 90 could be a typo for 9.0kg), 0.7m/6.9kg in final. 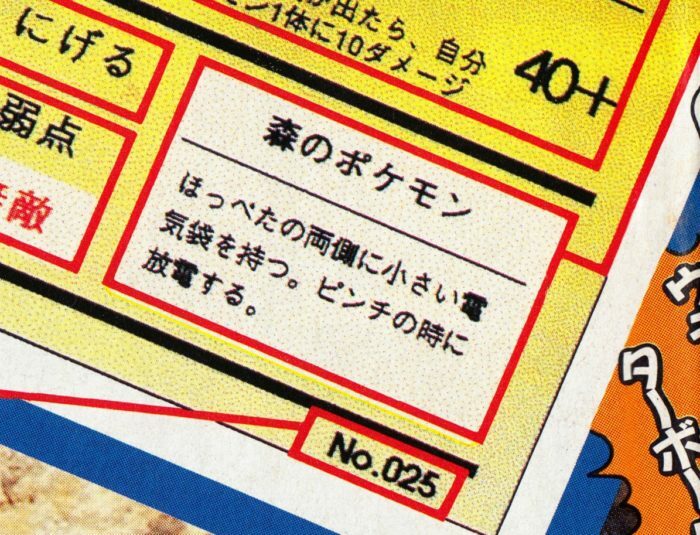 HP dropped from 60 to 40.
published in the September 1996 issue of CoroCoro Comic. 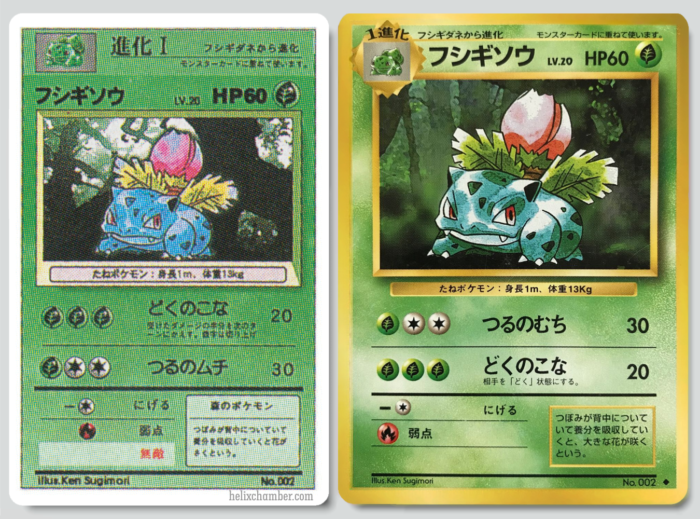 The art for this card was later used for the Japanese release of Erika’s Bulbasaur, while the background itself went on to be used for Ivysaur on its final base set card. 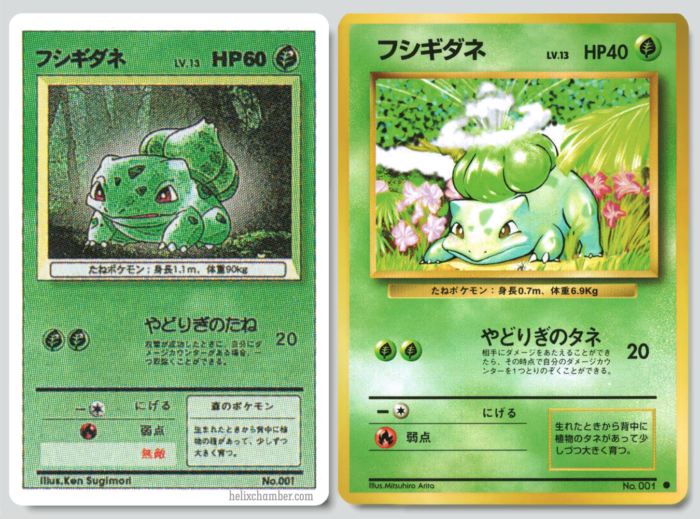 In fact, the Bulbasaur family all seem to have backgrounds cropped from one CG forest at different angles. 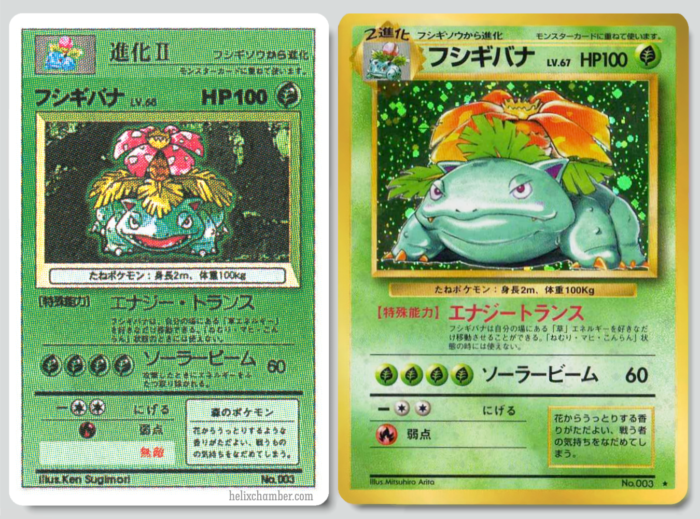 It’s kinda cool to see that they did model more of it than what was just used on Ivysaur’s final card. No height or weight change. Poisonpowder and Vine Whip are swapped. Poisonpowder describes the poison status, but doesn’t call it that. It just says “add a damage counter every turn.” It’s possible that status effects weren’t added at this time. It doesn’t call the accrued damage ‘poison counters’ either like Antidote does. Lv. 68 on the prototype card and LV. 67 on the final (Not so nice for Venusaur). Energy Trans has some minor grammatical changes. 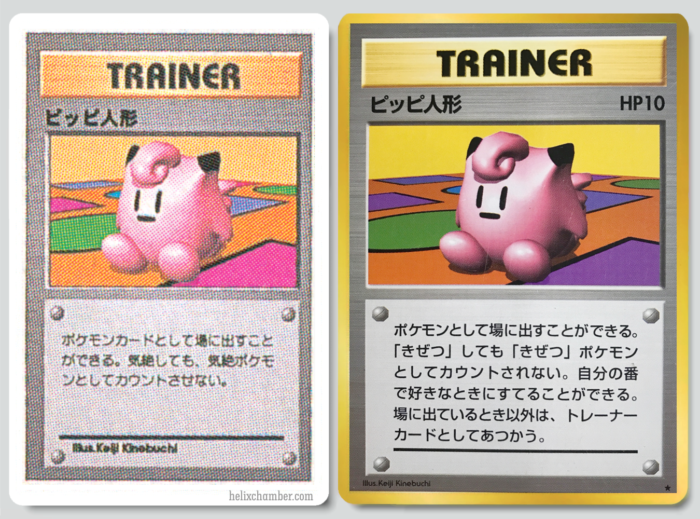 Note that status effects Sleep/Paralysis/Confused are mentioned on this card, unlike Poisonpowder on Ivysaur’s card. 0.4m and 6.0kg instead of 0.6m and 8.5kg. LV. 12 on the prototype card and LV. 10 on the final card. Ember discards an Energy card of any kind while the final requires that it must be a Fire Energy. 100 HP on the prototype card and 120 HP on the final card. Has Slash (Charmeleon’s move) instead of the Pokémon Power Energy Burn. published in the August 1996 issue of CoroCoro Comic. 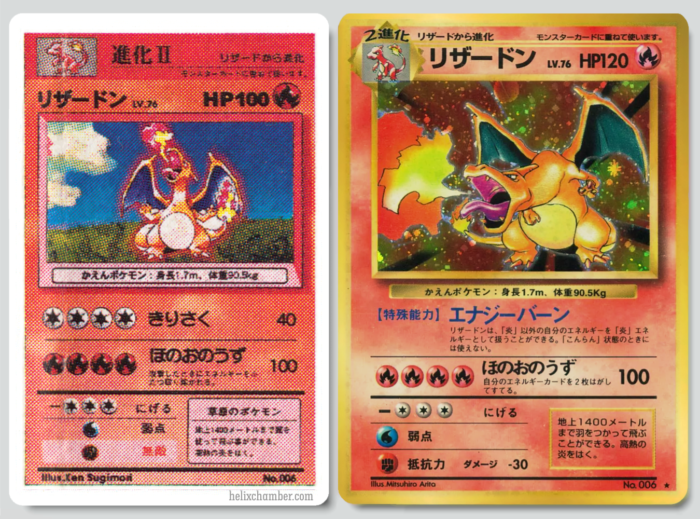 The art for this card was later used for Blaine’s Charizard years later, while that specific background seems to have gone unused even if a similar location can be seen for Ponyta’s background. 50HP (proto) vs 40HP (final). Nezumi (Mouse) is in katakana on the old card instead of the final hiragana. 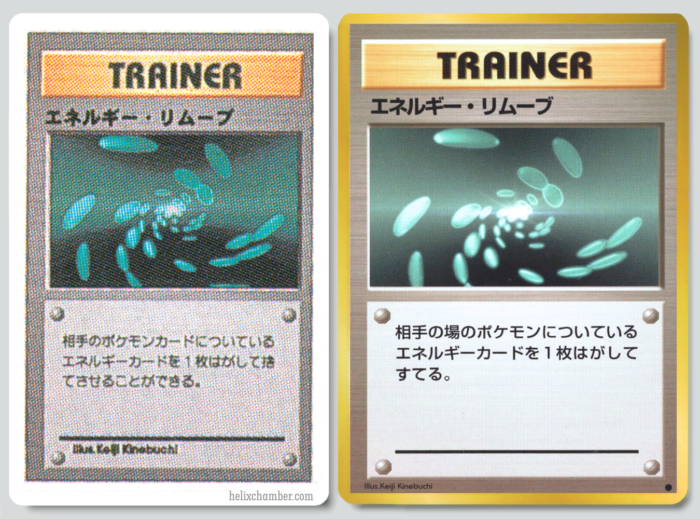 This card is the only known prototype card that has a katakana species name. The first move is Thunder Wave (proto) instead of Bite (final) and requires a Lightning Energy. 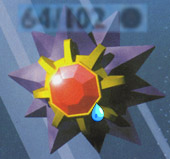 Thunder Jolt does 40+ damage but the description has the same effect as the final: Pikachu will do 10 damage to itself if you flip a coin and get tails. published in the August and September 1996 issue of CoroCoro Comic. 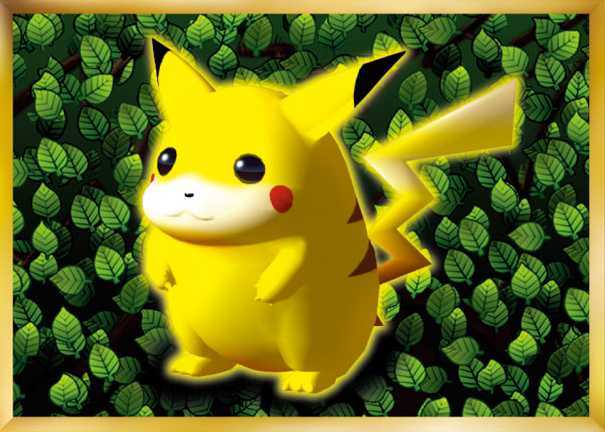 The background was later used for the “Glossy” CoroCoro Promo by Kinebuchi,released with the October 1996 issue, while the art went on to be used for Jungle’s Pikachu (the background art for the Jungle card actually coordinates more with the base set Raichu’s background). All attributes are the same. The moves are worded slightly differently but their effects are the same. LV. 20 on prototype card and LV. 14 on the final. Seems to be an earlier card as it uses kanji for game-related terms like “裏” where hiragana is used in the final. Sing doesn’t call it “the Sleep condition” and seems to instead say that the defending Pokémon falls asleep, but the text is fairly blurry so it’s hard to tell. “CG” is changed to katakana for the species name. LV. 18 with 60 HP on the proto-card instead of LV. 13 with 30 HP on the final. Has Conversion and Tri Attack instead of Conversion 1 and Conversion 2 in the final. Proto’s Conversion is identical to Conversion 1, but doesn’t state that the effect disappears if the defending Pokemon retreats to the bench like in the final. Tri Attack has you flip two coins and does 10x the number of heads. 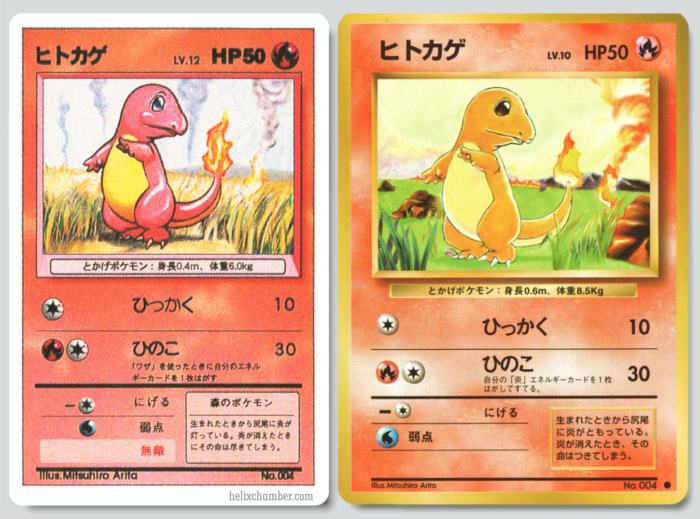 The artwork is erroneously attributed to Ken Sugimori instead of Tomoaki Imakuni, which may imply it was using the RG artwork at some point before this. Much like the “Rare Pokemon” (めずらしい) habitat in FRLG. 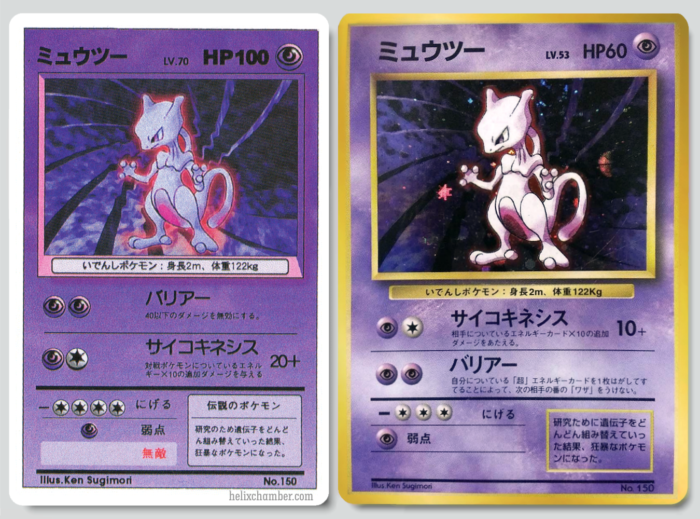 Mewtwo has 100 HP and is level 70 in this earlier card but has 60 HP and is LV. 53 on the final. Barrier and Psychic have been swapped. Psychic does 20+ originally instead of 10+, which doesn’t make sense because the description still says that it does 10 damage for each Energy card on the opponent. Barrier won’t let any attack under 40HP damage hit Mewtwo, while in the final you have to discard an Energy card in order to not be hit by an attack of any power. It appears this original effect later went on to inspire Jungle Mr. Mime’s Invisible Wall Pokémon Power where the effect was inverted (Damage higher than 30 is blocked). Retreat cost is 4 in the proto and 3 in the final. Machamp, Seel, and Poliwhirl are also (barely) visible in another promotional picture (possibly by Kinebuchi) published in the October 1996 issue of CoroCoro Comic, which also seems to feature a slightly different design for the back that now has the same white frame visible on the front. 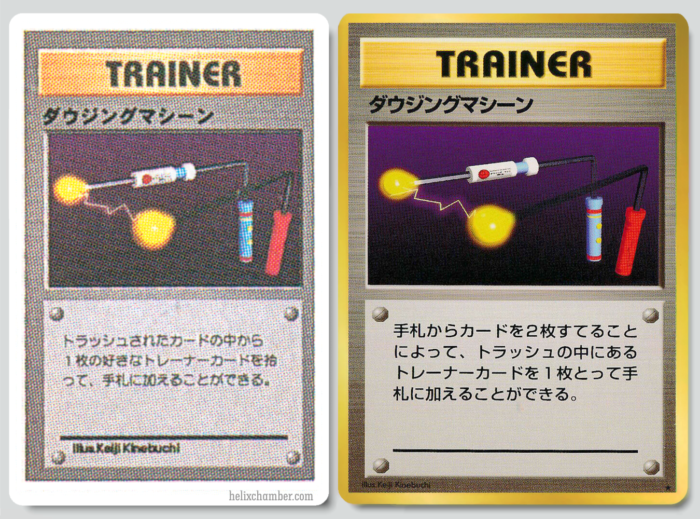 And finally, the early Trainer and Energy Cards. 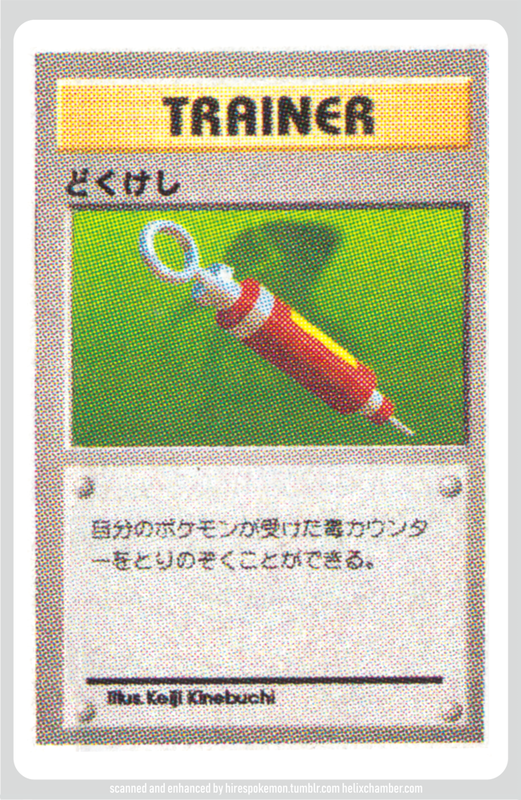 Let’s start with どくけし “Antidote” , a totally unused card! Antidote removes the Poison status effect from your active Pokemon. It’s possible that at some point there were also Parlyze Heal, Awakening, etc. cards but they were likely deemed redundant or added too much bloat to the first set. The Antidote model bears a slight resemblance to the Full Heal model in the final set. 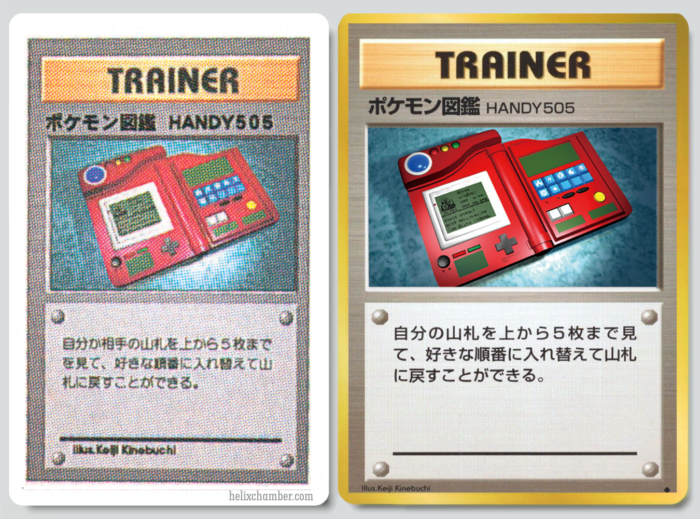 Pokemon Center doesn’t require you remove energy cards in the older version. Clefairy Doll has no HP in the prototype. The final version specifies that the doll won’t count as a fainted Pokemon, which made the card actually useful. Final version of Computer Search requires that you discard 2 cards in order to choose one card from the deck, but this prototype version has no discard requirement. Not even an Ace Spec could balance the old card! Itemfinder requires you to discard two cards in the final version. All other text differences (such as the ones found on Energy Removal) are small grammatical changes or reworded text. 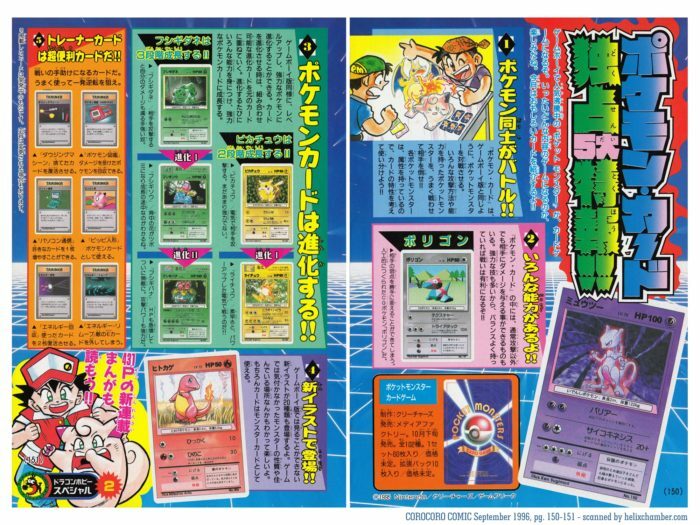 Dogasu’s Backpack Pokémon 1996 coverage including September and October CoroCoro Comic translations. 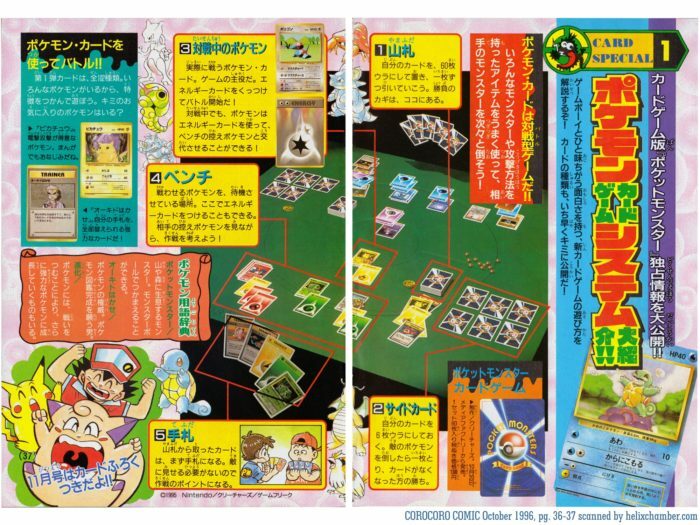 Zoidsland 1996 CoroCoro scans, August – September – October. 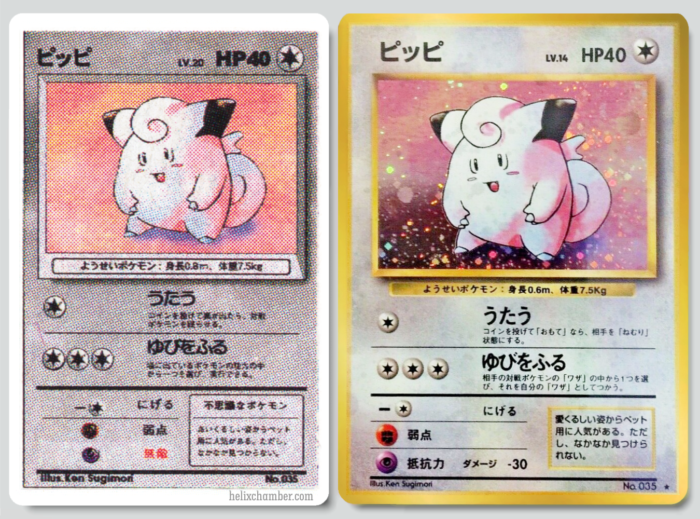 The final Japanese Base Set Cards pictures come from official sources, our scans and personal archives, unfortunately we couldn’t find the original source for all the scans (most of them came from online listings) if you recognize your scan and want to be credited just contact us! Thanks!